Reversing scar tissue after a heart attack to create healthy heart muscle: this would be a game-changer in the field of cardiology and regenerative medicine. 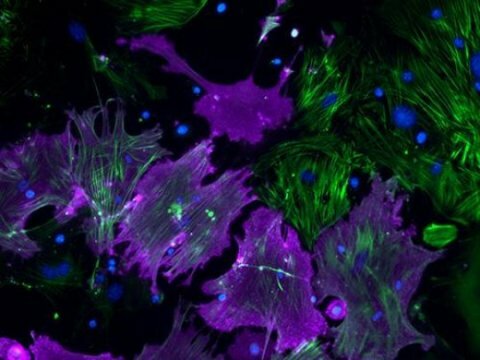 In the lab, scientists have shown it’s possible to change fibroblasts (scar tissue cells) into cardiomyocytes (heart muscle cells), but sorting out the details of how this happens hasn’t been easy, and using this kind of approach in clinics or even other basic research projects has proven elusive. Now, in a new study published today in Nature, UNC researchers report a breakthrough. They have used single cell RNA sequencing technology in combination with mathematical modeling and genetic and chemical approaches to delineate the step-by-step molecular changes that occur during cell fate conversion from fibroblast to cardiomyocyte. The scientists, led by Li Qian, PhD, assistant professor of pathology and laboratory medicine at the UNC School of Medicine, not only successfully reconstructed the routes a single cell could take in this process but also identified underlying molecular pathways and key regulators important for the transformation from one cell type to another. When we are babies, embryonic stem cells throughout our bodies gradually change into a variety of highly specialized cell types, such as neurons, blood cells, and heart muscle cells. For a long time, scientists thought these specific cell types were terminal; they could not change again or be reverted back to a state between embryonic and their final differentiated stage. Recent discoveries, though, show it’s possible to revert terminally differentiated somatic cells to a pluripotent state — a kind of “master” cell that can self-produce and potentially turn into any kind of cell in the body. Scientists have also figured out how to convert one kind of differentiated somatic cell type into another without detouring through the pluripotent stage or the original progenitor stage. Such findings shifted the paradigm of cellular hierarchy and revolutionized stem cell research and the field of regenerative medicine. Yet, figuring out how to study the specifics of these processes to leverage them for clinical and basic research has been difficult. Direct cardiac reprogramming, a promising approach for cardiac regeneration and disease modeling that the Qian Lab has pioneered and fine-tuned in the past several years, involves direct conversion of cardiac non-myocytes into induced cardiomyocytes (iCMs) that closely resemble endogenous CMs. Like any reprogramming process, the many cells that are being reprogrammed don’t do so at the same time. In this study, by using microfluidic single-cell RNA sequencing techniques, Qian’s lab addressed the two main issues of ‘asynchronous’ programming and heterogeneous cell populations. They analyzed global transcriptome changes during fate conversion from fibroblasts to iCMs. Using mathematical algorithms, they identified molecularly distinct subpopulations of cells along the reprogramming pipeline. Then they re-constructed routes of iCM formation based on simulation and experimental validation. These routes provided them an unprecedented high-resolution roadmap for further studies on the mechanisms of cell conversion. Her team discovered that the molecular features of subpopulations of fibroblasts were differentially suppressed during reprogramming, suggesting that the susceptibility of cells to be reprogrammed varies. Interestingly, this susceptibility coincides with the timing of cardiomyocyte differentiation during heart development. The signatures in the intermediate populations that seem to appear earlier in heart development were more resistant to the alterations. This suggests that the recent epigenetic memories of cells might be more easily erased, and so the fibroblast subpopulations with such epigenetic features are more easily converted into cardiomyocytes. “Manipulating epigenetic memories — not just changing their current epigenetic status — could be crucial for altering a cell’s fate for therapeutic value,” Qian said. With further analysis of global gene expression changes during reprogramming, researchers identified an unexpected down-regulation of factors involved in mRNA processing and splicing. The team continued with detailed functional analysis of the top candidate — the splicing factor called Ptbp1. Evidence suggests it as a critical barrier to the acquisition of cardiomyocyte-specific splicing patterns in fibroblasts. Qian’s research showed that Ptbp1 depletion promoted the formation of more iCMs. Additional quantitative analysis revealed a strong correlation between the expression of each reprogramming factor and the progress of individual cells through the reprogramming process, and led to the discovery of new surface markers for enrichment of iCMs.